We have moved to a new Home. Please Click Here or type www.amazinglanka.com/heritage at the address bar to access the most up-to-date information. This statue can be found on the old main road, which goes through the Weligama town and is about 12 Km away from the Matara town. To reach the site coming form Galle you should take the old road before you reach Ahangama across the railway track. You will see the sculpture on your right just before the second railway crossing. 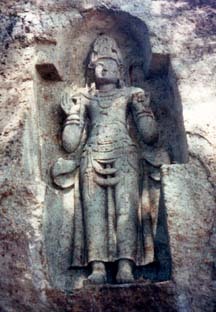 This statue is part of the Kushtarajagala Viharaya. This more than life size relief carved in solid rock is thought to be one of the best statues in the Mahayanist Buddhism in Sri Lanka. The origination of this sculpture is not known but many theories and folklore exists on the creation of the statue. It is also believed that this statue belongs to the period of 7-9th centuries. Another version of the same story talks about hoe the sick king made offering to a certain god when he was sick and once he was cured made a statue of this god he worshipped as a gift. There could be some truth in the above stories as Weligama was highly prosperous city in the ancient times and a center of foreign trade as Weligama was used as a harbor by foreign trading ships. But experts believe this statue is probably a Bodhisattva Figure (a person who is destined to become a Buddha in a future life) or of a god. The most common belief is that this represent the “Awalokitha” or the “Avaloktheeshvara” Bodhisattva of the Mahayana Buddhism. This is due to the presence of four meditating Buddha figures on his head dress and the lotus in the hand. “Avaloktheeshvara” Bodhisattva is one of the most powerful bodhisattvas of the Mahayana Buddhism. He is thought to be the most powerful healers of the mankind. It is interesting to note that even the folklore about this statue relates to a healing of a king. A similar relief can be found in the “Buduruwagala” in the Wellawaya area. Some also believe that this is a relief of the god “Natha” who is a god worshipped by the Sri Lankans. It is also believed that the “Avaloktheeshvara” Bodhisattva appeared in many forms in Sri Lanka and god “Natha” was one form. If this is true then the “Avaloktheeshvara” Bodhisattva and the god Natha would be the same. Irrespective of any belief this statue is the only remaining preserved statue in the wet zone and still people come to worship this statue to request relief from diseases.